The objective behind this student project was to design paper samples in a new, unique way. With vegetable seed packaging in mind, I selected paper quality, texture and color to closely resemble a particular vegetable. While naming each packet, I used alliteration to bring a playful personality to each piece. All die-cuts, illustrations, and sewn elements were created by hand. The use of digital media was not used during the production of this project. 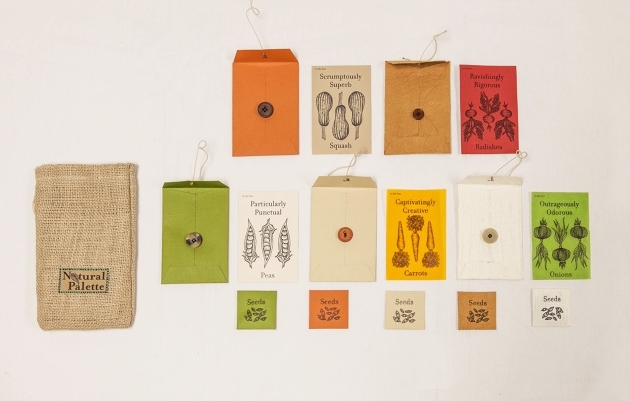 A burlap bag was chosen to hold the vegetable paper samples to further enhance the overall organic aesthetic. Each sample also included a small packet of vegetable seeds.